These carburetors are built for the high power small block engines up to the big block racing engines. Very capable of sufficiently feeding an engine up to 950 horsepower on gas, these carburetors are sized to each application so that each carburetor flows enough air to make all the top end horsepower possible while keeping the venturi size small enough to maintain good air speed at the lower rpms to provide great restarts and low end response. 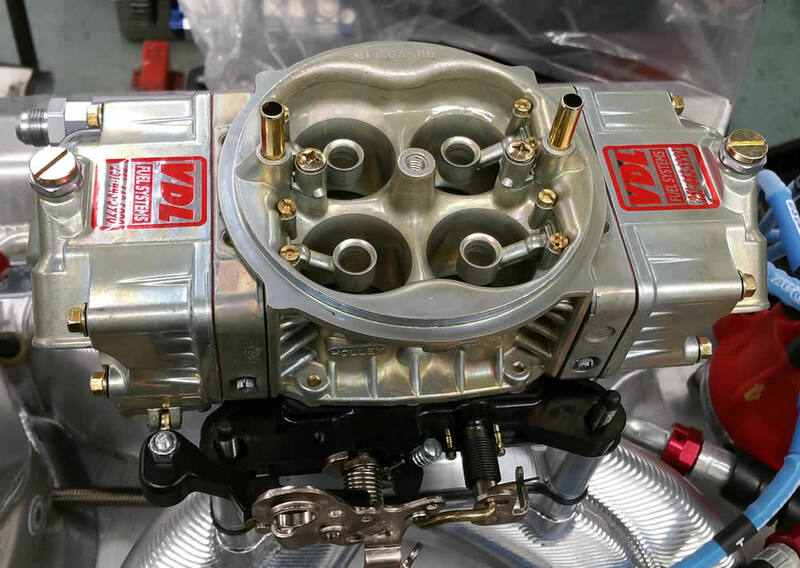 Many racers have found on their big block applications that taking a Dominator carburetor off and installing a VDL Fuel Systems custom CNC carburetor resulted in significantly quicker lap times. VDL Fuel Systems has done extensive dyno testing to establish the proper air/fuel circuitry and to produce a flat curve that results in maximum torque and horsepower. Most racing carburetors can be jetted to produce big torque numbers or big top end horsepower numbers, but there is always a trade off between the two. VDL Fuel Systems’ CNC carburetors have a balanced network of metering systems that produce a superior performance curve from start to finish. Assembly is done to tolerances unobtainable in high volume production. Boosters are installed to within .001’’ on height, twist, and pitch. The base plate is matched to the main body. All gaskets are properly matched to the main body to prevent overhang. And finally, the throttle plates are adjusted for optimum position angle on the flow bench. Track testing has given VDL Fuel Systems an extensive database for producing optimum throttle response and drivability in specific applications. VDL Fuel Systems produces a custom built; fully optimized CNC carburetor built to your specifications and engine application – not just another “out of the box” carburetor. You will notice the difference! Fuel Pressure – 6.5 to 7.5 pounds. You should absolutely know what your fuel pressure is! Many racers have no clue what their fuel pressure is, and they chase engine problems for weeks when a simple fuel pressure gauge would have indicated the problem straight away.